(Nanowerk News) Columbia research scientist Latha Venkataraman has demonstrated that in creating single-molecule electronic devices, flatter molecules conduct electricity better. That principle has long been suspected, but to demonstrate it definitively required an innovation to existing methods for measuring conductance in nano-scale objects. The field of nanotechnology involves designing machines and devices on a nano (billionth of a meter) scale. One of the main challenges for scientists had been in figuring out how to test the conductance of electronic components that consist of a single molecule. Scientists have come up with a number of techniques, but the large fluctuations in the results produced by these techniques have made it difficult to predict how individual molecules will behave as electronic devices. In her previous research, Venkataraman -- together with her colleagues Jennifer Klare, Colin Nuckolls, Mark Hybertsen and Michael Steigerwald from Columbia’s Nanoscale Science and Engineering Center – came up with a refinement of one of the prevailing methods for measuring conductance in a molecule. 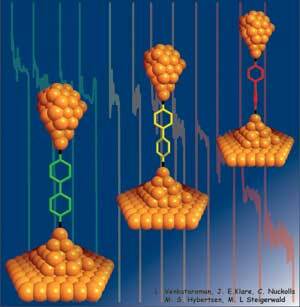 She used a novel amine-gold link to attach single molecules to the gold electrodes (Columbia research published in Nano Letters in March 2006). Venkataraman et al. have now applied this technique to provide definitive evidence to support a long-held belief that flatter molecules conduct electricity better than twisted ones.